Sharks Cove is a popular attraction for snorkelers and free divers alike, but take a few minutes to look at the cove through my eyes as I explore its caves and tunnels just under the surface. 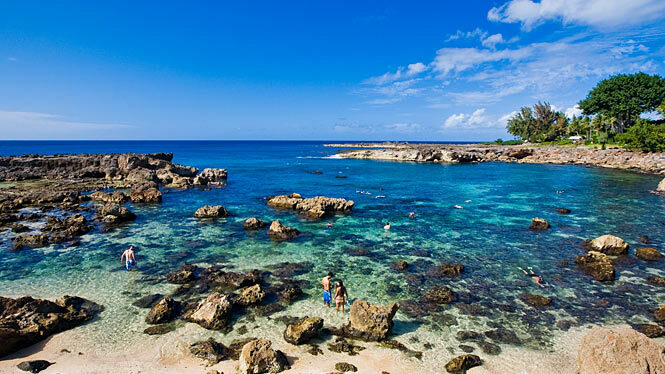 Sharks Cove is located on the North Shore of O’ahu and is part of Pupukea Beach Park. For those that might be discouraged by the name there is no need to worry – the name comes from the shape of the reef when seen from above (although you might run into a juvenile white tip reef shark from time to time). The big attractions to this dive site are the diverse marine life, as well as the underwater rock formations, making it ideal for beginner to intermediate divers. The caves and tunnels that are about 15-45 feet below the surface are great for experienced divers to explore. Keep in mind that there is no lifeguard on duty, so stay alert and practice safe dive procedures at all times. Layout: The terrain is jagged and I recommend you use dive booties for traverse the entry points. There are two main entry points: the “elevator” that is located to the right of the cove (see map), and the lower “walk in” area. Both areas can be slippery, so use caution when entering the water. As always, take a few minutes to examine the water conditions. Moderate to large waves at the site can throw you into some rocks at the entry points. Keep in mind that if you plan on exploring the tunnels that a surge under water can cause serious injury or worse, so take your time to assess the dive conditions before you decide to enter. Points of Interest: The opening of the cove is full of life and is great to explore the small overheads. If you go to the right of reef you will encounter a small cavern. Pass that reef finger you will encounter a few more caverns and tunnels that are a blast to explore. If you find yourself at the last and largest cavern, keep in mind that at the back is an opening that a few divers have not survived – I highly recommend that you DO NOT enter this area; tunnels like this are for experienced divers with extensive training in cavern exploration. Before you dive, remember to always dive with a buddy. Go over your pre-dive safety check, hand signals and emergency procedures (See Below). Sharks cove has a restroom area as well as a shower. If you get hungry there are plenty of food trucks just across the road as well as a Foodland. As always bring at the minimum some water to stay hydrated, and a first aid kit is always a good idea. Remember leave only bubbles and take only memories, have fun! • BCD secure and functioning properly? • Low pressure inflator attached? • Appropriately filled for entry? • Buddy familiar with operation? • Amount of weight appropriate? • System free and clear for emergency release? • All buckles and releases functional? • Locate releases without looking? • Sufficient air for dive? • Valve turned on all the way? • Alternate air source properly located? • Familiar with buddy’s alternate air source? • Air pressure at which to turn dive? • General check of buddy – nothing odd or out of place? • Fins, Mask and snorkel ready? 1. If one gets separated from a dive buddy, stop and do a slow visual 360-degree spin remembering to look both upwards and downwards trying to spot your buddies bubbles if possible. If you are carrying a tank-banger or an audio buddy signaling device, use it to see if your buddy can locate you from the sound. If you have a dive light on you, and visibility is low, use the light while doing your slow 360 degree spin to help your buddy locate you, or grab the attention of your buddy who could be behind a terrain feature or outcrop. Having spent a minute looking for your buddy in this manner, ascend to the surface slowly, while remembering to perform your safety stop. While at your safety stop deploy your SMB or “Safety Sausage” so that if your buddy is looking for you at the surface, he knows where you are. And perform another 360 spin looking in all directions for signs of your missing buddy. At the surface wait for your buddy to surface, while continuing to look to spot the air bubbles at the surface if conditions permit or if you were doing a boat dive return to the boat and inform the boat that you are missing a buddy. Do not re-descend once you have surfaced. If the missing buddy carries out the same procedure then the buddy pair should meet up again at the surface or near the surface. Always ensure you go over your plan for missing buddy discussing where and how long to wait before surfacing with your dive buddy before every dive. 6/24/17 Sorry, forgot to include my email Eddie. Would like to dive 8/9-8/17. My wife, son and I are PADI open water certified. 6/24/17 Hi Eddie. My wife, son and I will be on O’ahu 8/9-8/17 and would like to do some diving. How do we contact you? 6/19/17 Saving this article for next time I pass through Hawai’i! Mahalo Eddie! 6/9/17 I enjoyed this one! 6/9/17 I have been diving with Eddie at Sharks cove with my son, he was our guide. As an ex-commercial hardhat diver, I can truly say Eddie is a true professional but at the same time never loses sight of enjoying the dive. I look forward to my return trip next month to dive with him again. Would highly recommend him to anyone wanting a top notch dive guide / instructor. Aloha and mahalo Eddie!